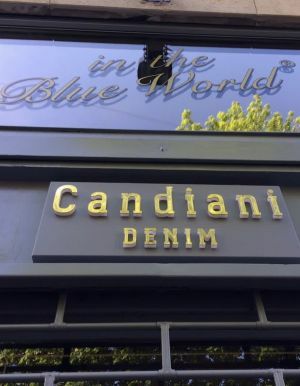 Fabrics x Retail: Alberto Candiani: "We don’t want to compete with our customers"
As part of Milan Design Week 2019, Italian denim manufacturer Candiani Denim has just opened its own store open to the public in Piazza Mentana 3, in the center of Milan. The new 300-sq.-meter shop is based at street level in a palazzo designed by famous Milanese architect Giò Ponti. It is a three-floor store selling a selection of premium jeans brands using Candiani Denim and a multifunctional space already hosting a special collaboration between Italian jeans brand Dondup, furniture company Busnelli and the denim mill. Alberto Candiani, owner, Candiani Denim, explains the reasons behind the project. Candiani Denim has opened a store that sells directly to consumers. Why? The idea has been there for a while, but that might have been misinterpreted as the intention to make and sell our own brand. But that’s not true because we don’t want to interfere with the market, nor do we want to compete with our customers. Actually, we want to be helpful and supportive with our customers and offer a cool place in the heart of Milan, our city, where we are showcasing our top customers and top collaborations with them. We sell pieces from Ace Rivington, Atelier & Repairs, Benzak DD, Blue Of A Kind, Care Label, Closed, C.O.F. Studio, Denham, Dondup and Matias all made with our finest selvedge denim Rivetto D’Oro. We not only chose them because we think they deserve it, but also because we have a long collaboration and strong partnership with them, and because they follow certain sustainable steps in their productive process. We were also looking for a spot that could tell who Candiani is. In Italy there is such a strong prejudice when it comes to denim as it is only perceived as American or Japanese. We are trying to educate a bit more about our textile heritage and trying to support our sustainable innovation. And Candiani is a good combination between the past and the future, tradition and modernity, as our store interiors also express. Is this shop going to be a temporary store? No. It will stay open forever as we bought it. It is based in a very central area of Milan, in 5Vie. It is facing three schools and near a very cool kiosk where many people hang out until late. Thus it will stay open until 9 pm. What we started is a long-term journey with our customers. Do people entering the store already know who Candiani is? We want them to learn what’s all about and tell them what we do, how we do it and about all of the sustainable ingredients we use plus, of course, about our relationship with brands. Next to our 110-sq.-meter store there is a second 230-sq.-meter larger space. This second space is now hosting an event part of Milan Design Week in collaboration with premium jeans brand Dondup using our Dzero eco-friendly fabric and furniture company Busnelli, though as soon as we are done with the Salone we start activities through which this “second store” can support our “first” one. This second space aims to be an educational workshop space for our customers who can come over with their merchandising and marketing staff. It can also host students and people interested in how we make denim. But it will also host the Blue Color office, a new company I own together with Candiani Denim. This company is in charge of branding, marketing and retailing for Candiani. And from it we will start many activation and education activities such as workshops and activities including live customization and proactive events in collaboration with our customers, very probably starting from 2020. Did any customer complain about not being included in the store? No complaints, just congratulations. Other brands understood our choice as brands that have used our Rivetto D’Oro [Golden Rivet] deserved it first. In the future we might enlarge the number of brands offered in the store, but I want to keep the exclusivity. A brand should create a limited edition for the store, something exclusive for it, which is a true proof of the collaborations between Candiani and the brand. Will you open other Candiani stores? I doubt it. Perhaps in the US, but for now it is a store and also works as a headquarters for Blue Colors [the company through which Candiani handles marketing and retail activities]. It is good for us as it gives us visibility. It is in Milano, which is attached to the company. But it needs to generate economy. And we also need to talk more to the consumer. Considering the crazy content of our fabrics–materials, finishing, sustainable process and similar aspects–we need to communicate that to the end consumer. I am not saying we are communicating better than our customers but we are just more efficient as we know what we do and we can tell the consumer what we are doing. This way we can help those customers who use the Candiani label and help them communicating what’s the good thing about sourcing Candiani. We are a textile brand and we will never be a jeans brand. First and foremost, we are emphasizing the strength of our textile operations. Why did you open a physical store in times when people are always more attracted by digital shopping? Denim is tangible and you have to see how it is–see the yarns and the fabric, for instance. The experience is not digital; the experience is live. Through this store we are trying to stimulate a more organic development of the message interacting with consumers so they can become our spreaders. Why did you create a separate company for this project? I didn’t want Candiani to be directly involved with retail and didn’t want to give the impression that Candiani wants to offer its own brand. To make this official I started a new company with people who are mostly working for Candiani, but what they do has not to interfere with the textile activity. It has to interact, not to interfere.